Teachers, the search is over. 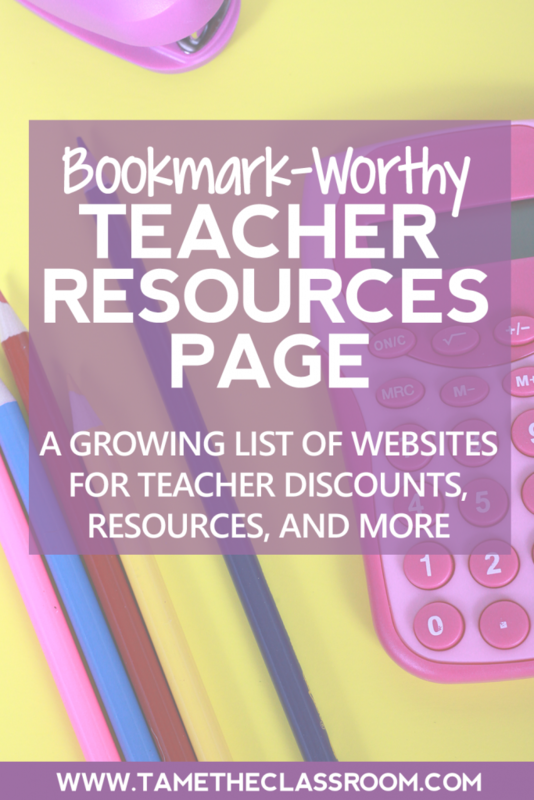 The best resources for teachers and their classrooms are listed on one page! Some things may be familiar to you. Other things are sure to be new to you. If you enjoy this content, be sure to bookmark this page because I will constantly update it when I find new teacher resources. If you use a particular classroom resource or other teacher resource and you think it earns the right to be in this collection, feel free to email me your suggestions at hello@tametheclassroom. When utilizing coupon codes and discounts found in the various links below, be sure to read each website’s rules, regulations, and policies. Sometimes exclusions apply for certain purchases or there are windows of opportunity to apply a discount. Disclosure: This page contains some affiliate links. When you purchase items after clicking on the link, I may receive a small commission at no cost to you. I only promote products or services that I have either used or strongly believe in. Please read my full disclosure for more information. Oriental Trading: There are so many great things to fill your classroom with from Oriental Trading. I love their classroom management supplies and learning games. Really Good Stuff: Hence the name, there are some really good teacher and classroom supplies at Really Good Stuff. One of my favorite resources purchased from here is their plastic book bins. School Aids:I really miss having a School Aids store nearby. Their locations are primarily in the South, but they have an online store as well. It’s a teacher’s dream store! School Aids purchases filled my classroom during my first few years of teaching. Educents: Educents is another great website to find resources for your classroom. There’s an interesting mix of physical products from your normal retailers and teacher-created digital products. Learning Resources:Early childhood teachers will find great things on Learning Resources. Most resources are targeted to Pre-K to 2nd but there are lots of science and math resources for the upper elementary grades too. Lakeshore Learning: Lakeshore Learning has everything from classroom décor and organization supplies to lesson manipulatives and more. When I moved into my new classroom in 2015, I found two new math games centers from Lakeshore. I’ve used them ever since and my kids absolutely loved them. Discount School Supply: Discount School Supply is another option for teachers who are looking for supplies and resources for their classrooms. Teachers Pay Teachers: I have a special place in my heart for Teachers Pay Teachers. 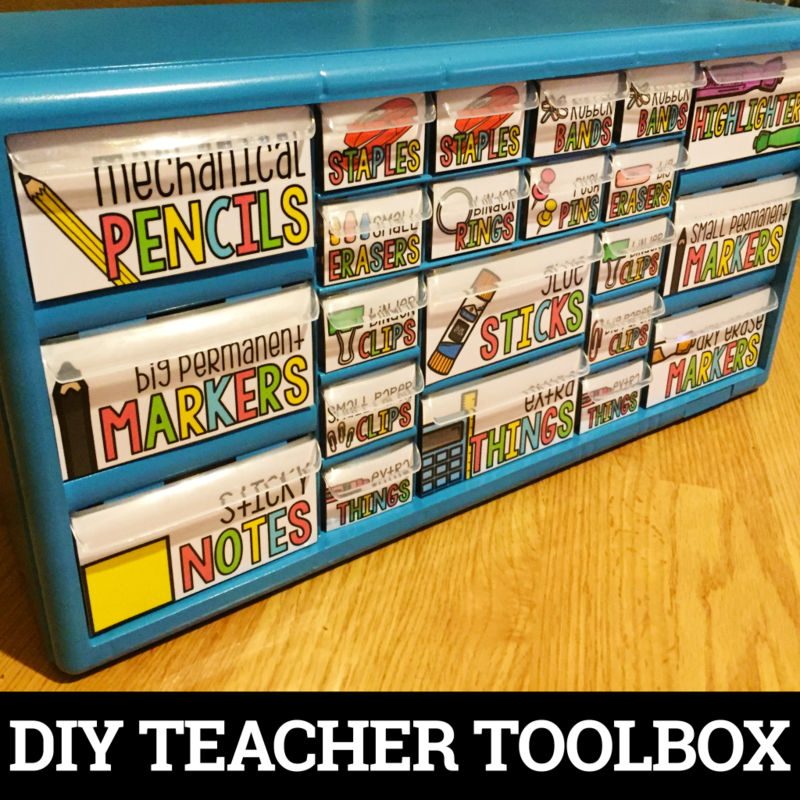 I have created and sold resources for teachers on TpT since 2011. Teachers Pay Teachers has millions of digital resources for every grade level and every subject. There are free and paid resources made by teachers, like me, from around the world. Teacher’s Notebook: Teacher’s Notebook is another place to find free and paid digital resources for your lessons. Michaels: My love for Michaels was kindled in the summer of 2015. That’s when they had these neon storage buckets. I definitely spent way too much money that summer, but my classroom looked fabulous! One day, while checking out, a lady mentioned her teacher discount, and I was like WHAT?! So ever since then I’ve used Michael’s teacher discount. It’s 15% off of your whole purchase EACH AND EVERY DAY! Yes, I’m yelling-typing because that’s amazing. Michaels typically has a 40%-50% coupon on one regular priced item every day too, so if you combine that with your teacher discount, you can end up saving a lot. The Container Store: I have finally organized my classroom, and that was accomplished mostly by containers. The Container Store has OODLES, yes OODLES, of containers for your classroom organization needs. They also have a program called the Organized Teacher Program. They will provide discounts and offers year-round that you can use online or in-store just by signing up for FREE. Hurry because this program ends December 31, 2017. I made sure to sign up before the deadline! Office Depot/Office Max: Office Depot/Office Max has more than just office supplies. There are tons of classroom supplies as well. Always be sure to check around Back to School time because Office Depot often marks their notebooks and folders down to ONE CENT EACH. I have racked up more than enough times! Office Depot has a Star Teacher Program where you can earn 10% back when you shop plus other perks. I’ve been a member of this program for a few years. There is also another separate program that could help your school earn free supplies when you shop at Office Depot or Office Max. Loft: The Loft gives teachers a 15% discount with a valid teacher ID. You can also join their LOFT Loves Teachers program for even more exclusives. Books-A-Million: Books-A-Million has an Educator’s Discount Program for teachers that gives them a 20% discount on most classroom items after they sign up. 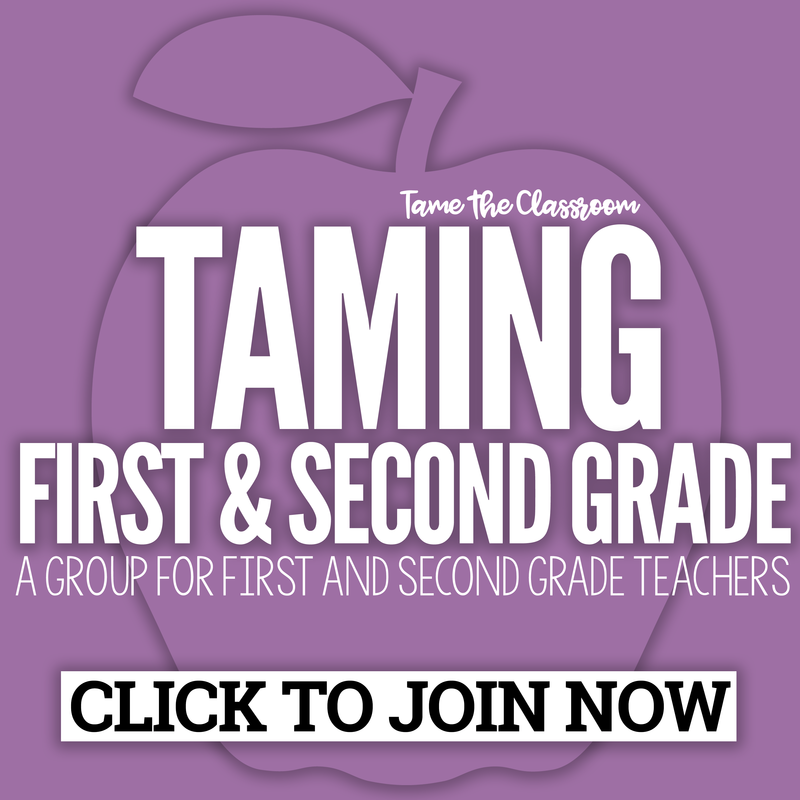 This is a free program for educators! What’s great is that it is open to K-12 teachers, librarians, and home school teachers. You can never get enough books to fill up your classroom library! SDE-Staff Development for Educators: If you have never heard of SDE, go explore their website and see if there is a professional development event near your city. Get Your Teach On: Get Your Teach On is the brainchild of Deanna Jump and Hope King. They host a few conferences a year to inspire teachers to be awesome in the classroom. Happy Go Teach: Happy Go Teach is a teacher conference hosted by Jen Jones and Kayla Delzer. Their mission is to create a conference experience for teachers that is out of this world. Zoey’s Attic: During the 2016-2017 school year, our school had a team theme and our grade level purchased shirts from Zoey’s Attic. I cannot tell you how much I love my shirt! L.Paull Designs For All: I absolutely love the t-shirts that teacher Lindsey designs. Tees 2 Ur Door: Tees 2 Ur Door has a great teacher shirts section of their website. Their designs are fantastic and their pricing is easy on a teacher’s budget. Mrs. Welch Creates: Mrs. Welch CreatesLaDonna is a teacher and she designs so many creative teacher tees at . GoNoodle: I have used GoNoodle since about 2014 in my classroom. I remember a rep from GoNoodle coming to our school and showing us the amazing way it was transforming classroom and getting students moving. Students can dance, exercise, do yoga, and do breathing exercises. Do not keep this free resource away from your classroom! Flair Pens:With the boatloads of grading you will be doing, you need a good grading tool! I noticed that everybody and their mama was using flair pens. I assumed that they couldn’t be that amazing. My teacher friend, Mandy, bought me a pack for my birthday and I haven’t looked back. They are so much better than using markers, like I used before. You need flair pens in your life, you really do. Erin Condren Teacher Planner:My first Erin Condren product was the teacher lesson planner, and it was given to me by the company, but I couldn’t imagine staying organized this year without it. I’m already scoping out my design for the upcoming school year. Use my referral link to create an account and you’ll be sent a coupon code for $10 off your first purchase of a planner. Hokki Stools: Hokki Stools are more expensive than many other types of flexible seating options, but the quality is worth the price. This is the #1 favorite spot to sit in my classroom. Stability Balls/Yoga Balls: I use the Gaiam Stay-N-Play Balance Balance Balls in my classroom. I love that they are sturdy and they have legs that keep them from rolling away. Edutopia: Edutopia’s website is overflowing with content for teachers. Through the Teacher Development portion of the website, teachers can view articles and videos on various topics. The lead teachers and curriculum coordinators in the school’s that I have taught in have used these videos in PLCs.